I am going to be 100% honest with you. I am going to flip flop the rest of this month. I am so behind on every nail art challenge it makes little sense to catch up. I am bummed about this because I mapped out all my manicures in my new “Cat Naps” planner. My entire plan flew out the window due to this seven-day flare! Initially, I did not plan on participating in the Winnie the Pooh challenge. I wish I did not have to because I L-O-V-E Winnie the Pooh. My dogs even wear Winnie the Pooh collars! But, I couldn’t think of any non-freehand art designs I could do so I figured it would be best for my arthritic self-esteem! But, I received a few stamping plates in the mail and it sparked an idea for both the 31DC2015 and Challenge Your Nail Art group. I love leaves. The way they change color in the fall, the way the holes age after bugs eat through them any other time of year is just amazing. Colorado State University was my #1 choice junior and senior year of high school. However, my school did not allow us to apply to any university without visiting first. This ended up in my favor as I only applied to one school. Anyways, my father and I eagerly flew out to Colorado and drove into Ram Country. There is only one weekend where the leaves turn color before they fall off the trees. Seriously, this color change only lasts a couple of days. We were so lucky we visited that one weekend. These gorgeous leaves cast a spell on the entire campus. Each tree was full of life and I knew I had found my home for the next four years! Every year after, I looked forward to that one weekend. I spent as much time as possible exploring campus, just to breathe in this gorgeous scene. I know it sounds ludicrous in some ways but I always felt completely at peace. I hope you like my manicure!! I started with 2 coats of Barry M Gelly Chili as my base. I used a makeup sponge, Chili and Sephora by OPI Mr. Right Now for the gradient. I stamped with Mundo de Unas Copper, Barry M Gelly Mustard and multiple images from Born Pretty Store plate BP-19. 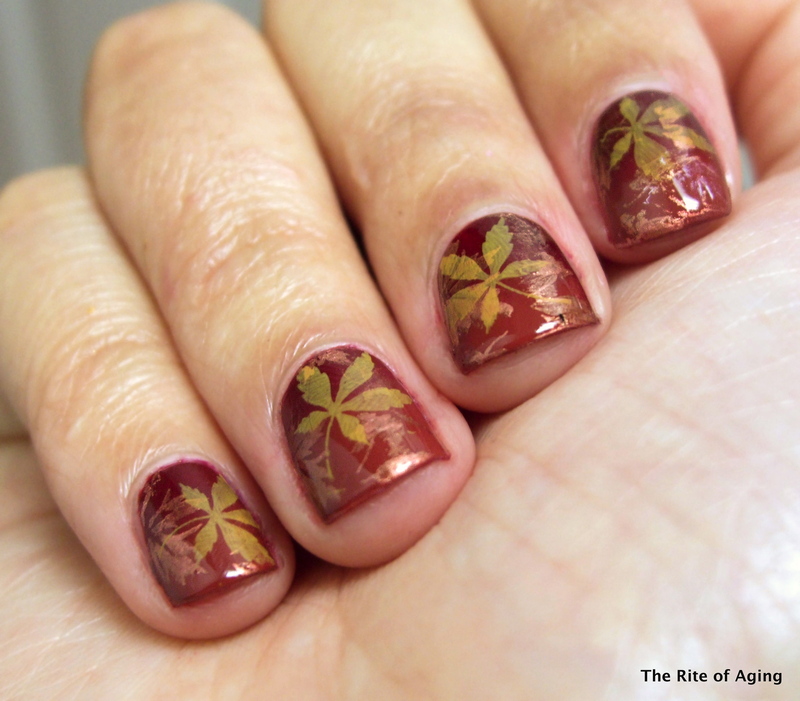 Check out the other tranquil manicures from the CNT 31-Day Challenge below! …And don’t forget to check out the other 100-Acre Woods manicures! Oh that looks cute! I love the layering.